PUT THIS ON YOUR RADAR. I want to cry from all the feels. And I totally squealed 'IT'S OVER?!' when I read the last page." In order to try and rehash some of my feels for this book (I read it a few months ago and didn't write the review right away, stupid me), I reread some parts and, well...MY GOSH, this book is SO GOOD. I got the feels again, and I just wanted to reread the entire thing over again. How to Love is what I'd call a lighter contemporary, but it's not cute and fluffy a la Anna and the French Kiss. It's reminiscent of Sarah Dessen and Rainbow Rowell, with a good story and good writing--and it's something you should really, really read. Let me talk about what I didn't like, which isn't much. (Either way, I'm giving this baby five stars on Goodreads.) My very few issues mainly had to do with openendedness. I like to know EVERYTHING, and while the ending was good, I was all "that's it?" Because I wanted more. Seriously, Katie Cotugno, if you're reading this, you should make a second book about (SPOILER ALERT) their road trip and I would seriously gobble that thing up. And if you need a beta reader...(END SPOILER). Also, I had a few issues with Reena's thinking sometimes. I kind of wanted to shake her and ask her what she was thinking and why she was doing that. Other than that...I can't think of any complaints. One of the things I really liked about How to Love was that it was told from Reena's POV in Before and After--Before Sawyer left and she got pregnant and after she had the baby and Sawyer came back. The best part about the Befores and Afters was that they really were Befores and Afters. There's a very clear difference in both times, in the characters and the story. Both Before and After Reenas had walls up, but in different places (and a few same), and they both had some sort of feelings for Sawyer. And then, of course, After Reena has a baby to care for. Before Sawyer had his light and dark sides, but he really needed some help. After Sawyer was more cleaned up and mature. What the Befores and Afters of both Reena and Sawyer had in common was that they cared for each other; they just had to learn how to love each other not as individuals, but as two people together. The characters were wonderful. I love when books have teen pregnancies, and this one isn't quite like an episode of Teen Mom (in case that would scare you off). While I wish there was more with Hannah, the baby, I liked when she was there and seeing how Reena acted as a mom. Reena was also a great MC. I enjoyed her voice, and while she didn't always do the right thing, she was a POV I liked reading from, and a character I liked. Then there's Sawyer LeGrande, who I just loved. And those two together...gah, the FEELS. From far away they looked perfect, but up close they had several imperfections. Their story arc was just grand, seeing it shape from Before and After throughout the book. I couldn't get enough of them. I feel like I didn't say everything I wanted to in this review and that's it all just a big mess. So to finish off, let me just say this: Read this book. I had this...feeling while reading it. Like, I was loving it so much and some scenes were just so AHHH that my eyes had a sort of sheen to them. And inside, I just felt...happy? Is that the word I'm looking for? I guess I just felt good while reading it. I hope you read this book and like it, too. And maybe, just maybe, you'll learn how to love. Did I love it? YES! Would I reread it? I want to right now. Would I purchase it? Can I have it NOW? Who would I recommend it to? Everyone, especially fans of Sarah Dessen and Rainbow Rowell. SOLD! I have added it to my TBR pile. Great review!!! Ohhh, I can't wait to read How to Love! Love your blog and can't wait to read more! 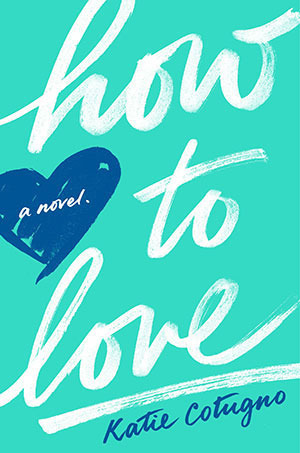 HOW TO LOVE is the best young adult book that I've read in the past two years. I can't wait to see what moving, realistic, and emotionally arresting stories Cotugno writes in the future. I know that I'll be reading every one of them.